Did you know you can actually check your Social Security Contributions online? I have been doing so since I discovered this option years ago. You can view your account online whether you pay as an employee or as a voluntary member. How it's done is very easy. But of course, a pre-requisite is that you are already an SSS member. If you are, here are the step on how to check your SSS contributions online. Step 1. 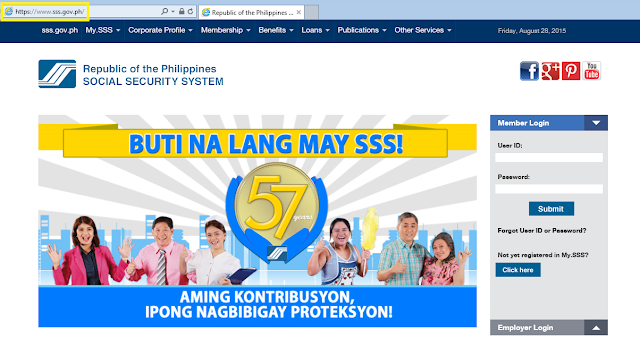 Head over the SSS official website by typing https://www.sss.gov.ph . Please make sure that nothing is missing in the underlined URL above (as highlighted in the image below) because there are mirror sites meant to steal information such as simply sss.gov.ph or even https://sss.gov.ph. In the web browser Chrome, you will be warned that the site isn't secure and attackers may be able to view your information. If Chrome, Firefox, or other browsers don't work, use Internet Explorer. 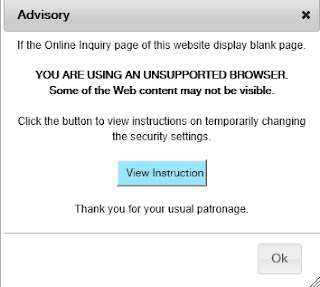 The SSS website was designed to work best with IE. You'll see an advisory about this once you log in. Step 2. After logging in, highlight the E-Services tab and click on Inquiry. Step 3. 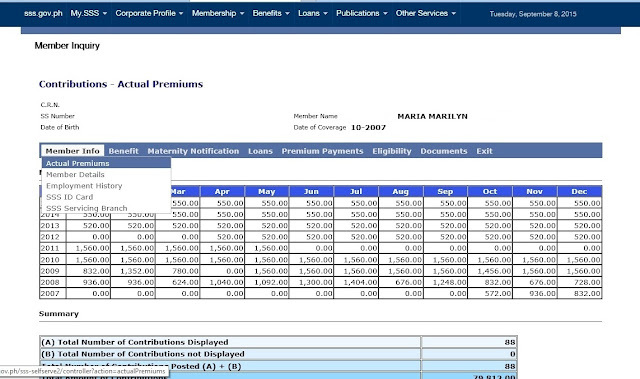 Under Member Info, choose the option for Actual Premiums to display all paid and credited monthly contributions. In most cases, posting the contributions are delayed (by months!) so don't worry yourself much when they don't appear online right away. Just keep your receipts safely hidden in case you need proof of payment when availing of certain services such as when claiming sickness benefit, loans, or other transactions. I've erased some pertinent information on the images by the way but you'll be able to see them displayed when you check the SSS website. There are more options and services which can be done through the SSS website and I'll be posting about them in the upcoming posts so stay tuned. Maari na pong makapag register ng SSS Number Online.